For other uses, see Natal (disambiguation). Natal (Brazilian Portuguese: [naˈtaw], "Christmas") is the capital and largest city of the state Rio Grande do Norte, located in northeastern Brazil. According to IBGE's July 2014 report, the city had a total population of 862,044, while Greater Natal had 1,485,505 inhabitants. The implementation of the Via Costeira (Coastal Highway), 10 km (6.2 miles) long avenue along the shore and the dunes, was the true starting point for the beginning of tourist activity in the State in the 1980s. The main hotels are concentrated along Via Costeira. Natal has several tourist attractions and is known for its natural environment (such as the waters of Maracajaú and the largest cashew tree in the world), for its historical monuments and buildings (e.g. Forte dos Reis Magos, the Alberto Maranhão Theatre and Newton Navarro Bridge), for its beaches (such as Ponta Negra, Pipa and Genipabu) and also for its off-season carnival, the Carnatal. The city also boasts the second largest urban park in Brazil, the Natal Dunes State Park. 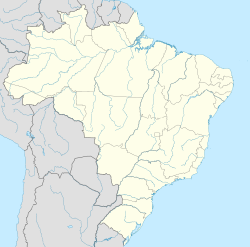 Natal is located at 5°46′S 35°12′W﻿ / ﻿5.767°S 35.200°W﻿ / -5.767; -35.200, in the far east of South America. The city has a total area of 170 square kilometres (66 sq mi). Natal lies on the Atlantic Ocean, at the mouth of the Potengi River. Natal has a typical tropical climate, specifically a tropical wet and dry climate (Köppen climate classification: As), with warm to hot temperatures and high relative humidity all throughout the year. 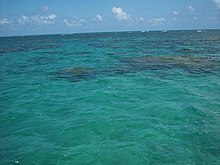 However, these conditions are relieved by a near absence of extreme temperatures and pleasant trade winds blowing from the ocean. February is the warmest month, with mean maxima of 31 °C (88 °F) and minima of 24 °C (75 °F), while July is the coolest with mean maxima of 29 °C (84 °F) and minima of 22 °C (71 °F). Rainfall is heavy at around 1,720 millimetres (68 in) per year, but there is a dry season between about September and January that is more distinct than further south on the Atlantic coast. The greatest amount of rain falls between March and July. 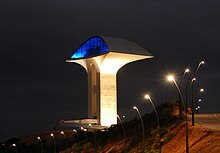 Known as the "City of the Sun" and also as "The City of the Dunes", Natal is located in the northeastern tip of Brazil. Lying about six degrees south of the equator the sun shines on for more than 3,000 hours every year. The average temperature in Natal is about 27 °C (81 °F). During the summer season it normally reaches above 30 °C (86 °F) with the water at a soothing 26 °C (79 °F). With its dozens of sandy, white beaches, such as Ponta Negra and its famous Morro do Careca, Tabatinga - the cliff of dolphins, Pirangi do Norte, Redinha, Pipa and Genipabu with its famous fixed sand dunes and imported dromedaries, tourism is the most important industry of Natal, attracting Brazilians, Europeans (many from Spain, England, Scandinavia, Germany, Portugal, Italy and France), and U.S. citizens alike. There has been an increase of 134% in foreign tourism in Natal between 2002 and 2005 (for the same time period the increase of foreign tourism in Brazil was 48%); This is a due to the accessibility of Natal and the appeal Brazil has for an increasing number of tourists, clearly showing that Natal is the area leading the Brazilian tourism boom. Natal is the number one area receiving international investments in Brazil. Natal will benefit enormously from the massive future investments on the coastline. Natal Dunes State Park is considered the second largest urban park in Brazil. Forte dos Reis Magos, a fortress built in 1598, is now a museum. The Cashew of Pirangi is the biggest cashew tree in the world. In 1994, it entered the Guinness book as the tree which covers the largest area, 8,400 square meters; larger than a typical football pitch. Due to a genetic mutation, the branches of this tree grow outwards rather than upwards; thus when a branch touches the ground, roots are not created, rather a new ramification starts to grow. There is even a gazebo located in the cashew, a popular attraction among tourists. Festa Junina was introduced to Northeastern Brazil by the Portuguese for whom St John's day (also celebrated as Midsummer Day in several European countries), on the 24th of June, is one of the oldest and most popular celebrations of the year. Differently from what happens on the European Midsummer Day, the festivities in Brazil do not take place during the summer solstice but during the tropical winter solstice. The festivities traditionally begin after the 12th of June, on the eve of St Anthony's day, and last until the 29th, which is Saint Peter's day. During these fifteen days, there are bonfires, fireworks, and folk dancing in the streets. Typical foods and beverages are served. As during Carnival, these festivities involve wearing costumes (in this case, peasant costumes), dancing, heavy drinking, and visual spectacles (fireworks display and folk dancing). Similar to what happens on Midsummer and St John's Day in Europe, bonfires are a central part of these festivities in Brazil. Festa Junina in other cities of the state, especially in the city of Mossoró which gathers thousands of people during the month of June. Alberto Maranhão Theatre (on the inside of it) is part of Historic Center. 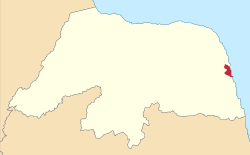 Natal was one of the host cities of the 2014 FIFA World Cup, for which Brazil was the host nation. The Dunas Arena was built in place of the old Machadão stadium. It is building a new airport, Greater Natal International Airport, to be the largest airport in Latin America. It is also investing in a public transport system using the system of light rail called VLT de Natal, and other projects of infrastructure. David Beckham had announced plans for a football academy in Natal, called the Beckham World of Sport, to coincide with the 2014 FIFA World Cup. Natalenses is the name in Brazil for residents of Natal. The supermodel Fernanda Tavares is from Natal. ^ a b "Aeroporto de São Gonçalo: pistas estão garantidas, mas terminal ainda não". Correiodatarde.com.br. 2007-09-25. Archived from the original on 2012-07-04. Retrieved 2012-06-25. ^ "Christmas in Natal - Natal em Natal". www.natal-brazil.com. Retrieved 2015-09-21. ^ Destination360.com. "Climate of Natal". Retrieved 25 Jun 2012. ^ "WIN'13 - 24th International Workshop on Weak Interactions and Neutrinos". Retrieved 29 January 2015. ^ Instituto Nacional de Meteorologia. "NORMAIS CLIMATOLÓGICAS DO BRASIL" (in Portuguese). Retrieved 31 May 2018. ^ Brazilian National Institute of Meteorology. "BDMEP - série histórica - dados diários - temperatura mínima (°C) - Natal" (in Portuguese). Retrieved 31 May 2018. ^ Brazilian National Institute of Meteorology. "BDMEP - série histórica - dados diários - temperatura máxima (°C) - Natal" (in Portuguese). Retrieved 31 May 2018. ^ "Tabela 1287 - População dos municípios das capitais e Percentual da população dos municípios das capitais em relação aos das unidades da federação nos Censos Demográficos" (in Portuguese). Brazilian Institute of Geography and Statistics. Archived from the original on March 25, 2014. Retrieved August 17, 2015. ^ a b "IBGE divulga as estimativas populacionais dos municípios em 2014". Brazilian Institute of Geography and Statistics. August 28, 2014. Retrieved August 17, 2015. ^ "Região Metropolitana de Natal em 20 perguntas". Nominuto.com. 2008-06-29. Retrieved 2012-06-25. ^ Síntese de Indicadores Sociais 2000 (PDF) (in Portuguese). Natal, Brazil: IBGE. 2000. ISBN 85-240-3919-1. Retrieved 2009-01-31. ^ GDP (PDF) (in Portuguese). Natal, Brazil: IBGE. 2006. ISBN 85-240-3919-1. Retrieved 2009-07-18. ^ per capita income (PDF) (in Portuguese). Natal, Brazil: IBGE. 2006. ISBN 85-240-3919-1. Retrieved 2009-07-18. 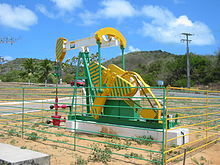 ^ "Universidades no Rio Grande do Norte". Seruniversitario.com.br. Retrieved 2012-06-25. ^ "Aquarium of Natal". Natal-brazil.com. Retrieved 2012-06-25. ^ "UOL - Página não encontrada". Viagem.uol.com.br. Archived from the original on 2011-07-26. Retrieved 2012-06-25. 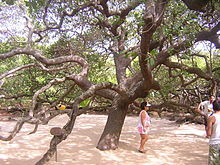 ^ "The biggest cashew tree of the world". Natal-brazil.com. Retrieved 2012-06-25. ^ "Prefeitura do Natal". Natal.rn.gov.br. Retrieved 2012-10-06. ^ "Carnatal". Natal-brazil.com. Retrieved 2012-06-25. ^ "Access - Natal". Viagemdeferias.com. Retrieved 2012-06-25. ^ "Bus in Natal". Virtualtourist.com. Retrieved 2012-06-25. ^ "Natal - Taxi Transport". Natal.olx.com.br. 2007-05-07. Retrieved 2012-06-25. ^ "Taxi in Natal". Guiamais.com.br. Retrieved 2012-06-25. ^ "Buggy in Natal, RN". Passeiodebuggy.com.br. Retrieved 2012-06-25. ^ "Beckham in Natal". Uv10.com. 2008-02-01. Archived from the original on 2013-02-09. Retrieved 2012-06-25. ^ "Federaусo Brasileira de Basquetebol Master ::". FBBM. 2007-10-24. Retrieved 2012-06-25.